Commercial landscaping around a sign must draw the attention of people passing by while improving the look of the landscape and neighborhood. It must look good year-round and be low-maintenance and durable as it is likely to be located in an area that experiences extreme conditions such as heat, car exhaust, and pedestrian traffic. Whenever you are choosing the plants for a landscaping project around a sign, be sure to choose plants that cannot grow tall enough to eventually block the sign. For ideas, you can drive around and look at other commercial landscapes in your area. Many commercial landscapes now use native grasses and perennials, because they require less water than most bedding plants used in the past, and don't need to be replaced several times a year. When choosing flowering plants, select plants with the same color flowers as the dominant colors in the sign. The mass of color will draw attention to the area and your sign. 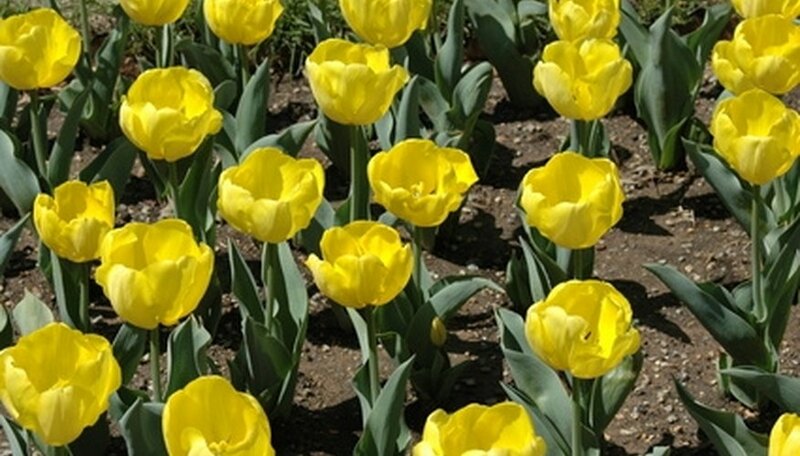 For example, if your sign has a yellow background, choose plants with flowers that are yellow or shades of yellow. Choosing plants with many different textures or colors is confusing to the eye and will take attention away from your sign. When someone looks at a circle or oval shape, the eye is naturally drawn toward the middle. For this reason, creating a circle of plants around your sign can be more effective than a square or rectangle arrangement. You can establish attractive landscaping around a sign by creating a circle with a tiered effect, using the variation in sizes of plants. This is done by establishing a circle around the sign for the flower bed, then planting the tallest plants closest to the sign, medium sized plants just beyond the tallest, and the smaller border plants the farthest from the sign at the inside edge of the flower bed. This makes the highest part of the flower bed the signage, which creates a focal point. The eye of someone passing by will be naturally drawn from the ground to the sign or toward the middle of the circle. Another method of drawing attention to your signage using landscaping is to frame the sign with plants. This is done by planting small blooming trees or shrubs, such as redbud trees, crepe myrtles, or ornamental fruit trees on each side of the sign. Then prune or train them so they grow up the side of the sign and over the top without interfering with the line of sight leading to your sign. The circle around the sign is kept mulched and clear of plants. This creates a focal point with the two attractive small trees or shrubs framing the sign. If you are unable to build a flower bed because the area is covered with asphalt or cement, build a planting container around the bottom of the sign with stone or wood. Fill the planting container with soil, then add colorful perennials or ornamental grasses that spill over the sides and create an attractive and eye-catching display.